Irish soda bread, scones and apple pies are catching on again with the desire for comfort food in these recessionary times. No longer the 'preserve' of delicate ladies with hats, homemade Irish soda bread, jam, scones, apple pies & rhubarb tarts, tea brack and fruit cakes have never been more popular. Good staple ingredients like flour, whole milk and butter go into the best bread, scones and cakes. Quicker to make then to go to the shops and buy, scones can be made in a couple of minutes from sieved self-raising flour with a small amount of butter rubbed into it, a couple of spoons of sugar,a handful of dried fruit (sultanas and cherries) with a little milk and egg to bind. Popped into a hot oven for 10-15 minutes they are best eaten warm, with butter and and some lovely Clare jam, blackcurrant and port, or raspberries and champagne flavour, can you tell why it's my favourite...? Another favourite is apple pie or rhubarb tarts. Made with short crust pastry, and filled with either cooking apples sprinkled with cloves, or fresh rhubarb and grated ginger these feature on most desert menus throughout the country. Best served up steaming hot, with a dollop of fresh cream and a pot of Lyons or Barrys tea Fresh rhubarb tarts in season (Spring) are rare but divine. Not so rhubarb and ginger jam which thankfully is available all year round. Tea bracks are made from dried fruit soaked overnight in tea to plump up the fruit, with flour and sugar and mixed spice added before cooking in a slow oven. Often served sliced with butter, or with lucky tokens added into the mix for Halloween. Lady Gregory of Coole Park used to have a huge one made which included hazelnuts from the seven woods at Coole, for the opening night of each new play at the Abbey Theatre, which she founded. Fruit cakes are a more luxurious combination of fruit with cherries, nuts and spices, butter, eggs and flour and a generous drop of whiskey (for preservation purposes) of course, often made for special occasions and Christmas when they are coated in almond paste and soft lemon icing. 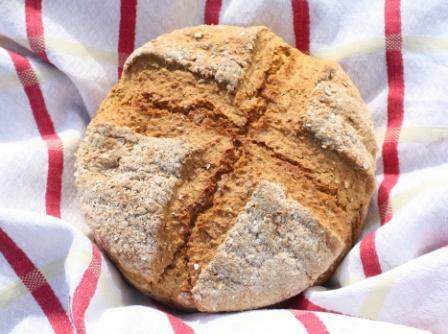 Simple Brown Bread Recipe add a couple of ozs of melted butter to a generous lb of wholemeal flour with a good teaspoon of baking soda mixed through it, bind with buttermilk, knead lightly into a round cake, cross the top, say a prayer and pop in a hot oven for about 25-30 minutes. You will know its done when it is nicely browned and if there is a hollow sound when tapped. 1 An Fear Gorta Ballyvaughan, Clare lovely old stone cottage by the sea with a walled garden. Steven Spielberg stops by regularly (in his private jet) to sample his favourite cheesecake. 2 Avoca Handweavers known as the 'possibly' shops because they sell the most delightful homegoods and are 'beyond' pretty. Excellent food you can buy to takeaway as well. 3 Bewleys Grafton Street there is no where quiet like it in the world, a whiff of ground coffee and an almond bun, takes us right back to student days. 5 Claires Tearooms, Clarinbridge, Galway. This is the kind of place your Mum, Aunt or Granny would love, me too! Delicate bone china, light as air quiches & cup cakes. 7 Goya's Kirwans Lane, Galway. Apart from luscious cakes you can by or have made to order? the lemon meringue pie is about a foot high? they do a delicious liver pate salad for lunch, order extra toast! 8 O'Connors Bakery Galway, Ennis & Limerick, for the domestically challenged like myself? you can buy the best 'homemade' (no one will ever know) bread, cakes and apple pies. I have even manged to pawn off their Christmas cakes and puddings as my own. 9 Powerscourt County Wicklow, a lovely day out, you can take the grand tour around the house, or sit out regally with a hot chocolate or glass of wine, on the terrace overlooking the sugarloaf mountain. 10 Bunratty Castle & Folk Park where you can watch scones and apple pies being made and eat them afterwards in the tearooms.